Weather: it was dry and very hot. Especially in Nukus, Khiva in Bukhara. Temperature here rose up to 45 degrees and it was not even high summer. In Samarkand is was a bit cooler but still pretty hot. ATM's: There should be some but we have not used them. In Uzbekistan everybody changes money at the black market and those rates are much better. Just go to any market and sure somebody will come to you. Or you can change at hotels and guesthouses; they offer the same rate as on the black market. So your best option is to bring cash, preferably US Dollars, although they also change Euro's. In most hotels you can also pay in US Dollars. Sometimes you have to bargain, but throughout the country we got the same rate everywhere. Safety: Uzbekistan is pretty safe. Despite the registration rules we have bushcamped a few times and no one bothered us. Fuel: diesel is 4000 SOM. (about € 1,- ) per liter. Availabitly of diesel is a big problem and almost no filling station is selling it. Regardless the direction you are coming from, just fill up as much as you can. The route we drove was about 2200 kilometers. If you do need diesel it is best to get some help from locals as they speak the language and ask around. We found some in Bukhara, but only after being send from one place to another for about one hour. Price is also pretty high (about 4000 - 4500 som per liter). If you are really desperate you can also try at the TIR-parks. There are Iranian TIR-parks and Turkisch TIR-parks throughout the country. It is here where the foreign truck drivers sell their own diesel to Uzbek buyers. In Bukhara however they did not want to sell to us as they only sell to local people and we had to buy from them they said. 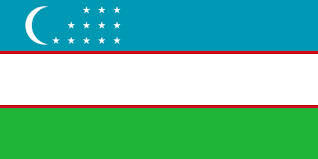 Camping: In Uzbekistan there are no campsites. In some places hotels are guesthouses allow you to camp and use their toilet and shower for a fee. For this we paid between 20.000 SOM per person per night. Prices: Except for the seasonal fruits and vegetables all other fruits and vegetables are quite expensive compared to neighbouring countries. Bread: 1 bread costs 1000-2000 som. Other: Due to all the environmental problems tap water is not safe. Bottled water can be found everywhere and is very cheap. We obtained our visa at the Uzbek embassy in Brussels. This is also the embassy for the Dutch. To apply for a visa you need a LOI (Letter of Invitation). We organised the LOI through www.stantours.com. The price of the LOI depends on the number of entries. For a double entry the price is $80 per person. For the LOI you need a letter of current employment (see example here). After receipt of the proof of Payment the LOI is organised. This can take up to 2 weeks. (we had ours in just over one week). Officially the LOI is valid for 1 months but most embassies are not that tight. Please be sure you know at which embassy you want to pick up your visa because this is mentioned in the LOI en the Letter is send to the embassy of your choise. Although offcially the period is max. 3 months the embassy in Brussels has no problem with issuing the visa earlier in advance. Visa application can be done by mail (see website embassy for instructions), but collection of the visa must be done in person by at least one member of the party. Visa handling may take up to 10 working days. Although in our case we could pick it up in just a few minutes as the embassy had all our details in advance (which was arrange by stantours). Payment of the visa has to be made at collection. see example of visa request letter to be send to embassy with application. Price for the visa €80,- per person for 30 days double entry. Price for single or double entry are the same. Registration: Travelling on a tourist visa you have to register within 3 days after arrival. Registration can be organised through any licenced hotel or guesthouse. Besides your first registration you also have to register during your travels. Officially you only have to register when staying in a place for more than 3 days, but as rules are not very clear some will tell you you have to register every day. When we checked this at our embassy in Brussels and they explained that when you collect a couple of slips (one for the first regestration within 3 days and a few more during the rest of your stay), that you would be fine. Doing this way it still give you room to bushcamp. As it was very hot during our stay we spend a few nights in a hotel and most other nights we found places where we could camp, use a shower and get a registration as well. We only bushcamped twice. On our drive to the southern border at Denav we had to show our registration slips at a police check point. Missing a few nights was not any problem. Have no slips at all would have been a huge problem though, so we were very glad we had registered. Entry: At Nukus, on the border with Turkmenistan. Although the process can be very time consuming (it took us 2 hours), there was not much trouble and we did not had to pay anything. One of the issues they are most interested in is the cash you are carrying and the medicine. We declared this honestly and there was no problem. From other tourist we heard that if you declare only some of your cash and on departure they will find more than you have declared on entry you might have to give up the difference. As our cash is hidden quite well we have not declared everything. Just make sure that the amount of foreign money you declare on exit does not exceed the amount you declared on entry. Exit: At Denov, on the border with Tajikistan. Border was open untill 9 pm. Formalities on the border were slow but without problems. Only customs asked a lot of difficult questions about everything we carried. We alway declare all our cameras, phones and computers as one post called "electronics" but they wanted it specified. Also they wanted to see the medice again. From other travellers we heard that on some borders they also want to see your insurance papers. This can be a problem as on the Nukus border there is no possibility to get any insurance for the car. We drove without insurance thoughout the whole country. On the Denov border they did not ask for any insurance papers nor for the registration slips. Insurance: At the Nukus border there is no possibility to buy an insurance. We drove uninsured the whole time. General: All the roads we travelled were tarmac, but many of them were in pretty bad condition (damaged tarmac and a lot of potholes). Some parts however were brand new. 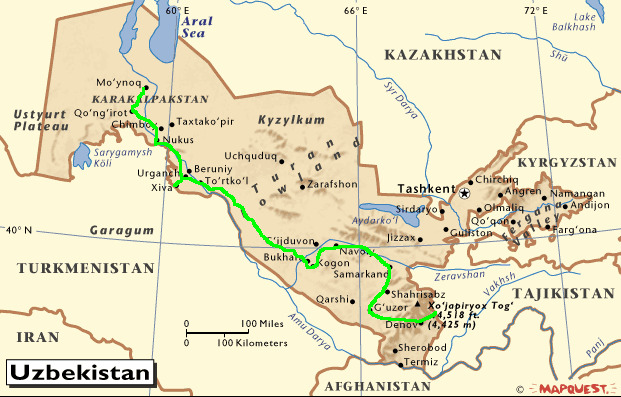 From Samarkand to Denov: Despite a few bad parts this was one of the better routes in the country. Even the shortcut from Sajroo to Denov is quite good in most parts. From Nukus to Moynaq: There is only one doable road and that is from Nukus to Xojayli to Qongirot to Monaq. Do not go by Chiboy route as this road is really bad and at the end there is a bridge that sometimes cannot be crossed. Nukus: Not a very special place, the bazar however is worth a visit. Moynaq, Aral See: Once this was an important Fishing village, nowadays the shores of the Aral Sea are about 180 km away. Here you can see the effects of the Aral Sea disaster with you own eyes. In the desert surrounding the village there are some rusted fishing boats lying in the sand. The village has also a small museum which is definitely worth a visit. Entry fee to the museum is 5000 Som per person. Khiva: The smallest of the 3 famous silk road cities. Easy to walk around. It is smaller than Bukhara and Samarkand but beautiful restored and with a nice atmosphere. Also specials are the the grave yards near the city walls. Bukhara: A bit bigger than Khiva but also beautiful. Special here are several small covered markets. Uzbekistan can be really hot. In Khiva we went for a swim in Hotel Khiva Asia. It is a very expensive place and for 15000 som per hour they allow to have a swim in their pool. If you want to relax in the chairs for the rest of the time their is no extra charge. Hotel also has free wifi. Hotel Jipek Joli in Nukus. Very clean hotel with secure parking. Price is 55 USD per night including breakfast. Room has airco and wifi. Hotel gives registration slip. Camping on parking of Arkanchi Hotel in Khiva. Camping costs 40.000 som per night for parking, shower and toilet. You get a room. Also got a registration slip here. Madina Bed and Breakfast in Bukhara. Clean room. Run by a very friendly Iranian lady. Wifi, airco and tv in the room. Price 15 USD per person per night including breakfast. Location near to the old center. Got a registration slip here. Bushcamp at a lake 50 km from Bukhara. Nice place good swimming. No facilities. Camping in the street in front of Bahodir Bed and Breakfast in Samarkand. Overlanders place. Price 8 USD per person for shower, toilet and breakfast. You get a room for this. Free wifi. Got a registration slip here.